Moreton Island to Budds Beach on the leeward side was our suggested trip for the Rosco Calendar over the Easter long weekend. A chap spoke up and said given we would be likely to encounter a SE, heading in the other direction may be wiser. The God of Paddling (Ron Steele) had spoken so we mere mortals did an about face. Malcom, Mark and I packed the boats on the grass in the shade at Budds Beach. Some Japanese tourists sat and watched with fascination as the pile of gear collapsed into the hatches. Well almost all of it - Malcolm had a fair bit strapped on the back deck of the Contour. They then got the story from my parents as to what we were doing with all this stuff. They were horrified that such small boats would make the journery. Some of my sentiments were not too far off as this was the first extended camping trip we had planned on our pat malone. I was secretly petrified of being sucked out at Jumpin Pin or the South Passage. With my Mum and Dad heading off to Brisbane with the car and trailer it was time to get the show on the road. Day 1 was a doddle to Curigee North. Don't want to get too ambitious. 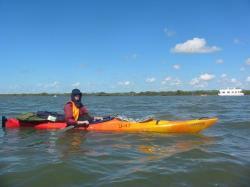 We knew somewhere along the line Allan and two paddlers may be joining us, possibly on Day 2 or 3. 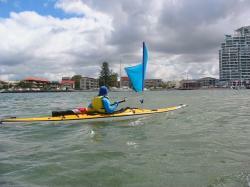 The Broadwater had its usual share of idiots buzzing around on jet skis and in power boats. Coming up to the Grande Hotel a person was running towards the jetty waving his arms calling out what I thought was 'Betty'. Mark thought it was 'paddlers'. Maybe this was one of the people going to meet up with us. As we headed toward the jetty, he stripped off (nice physique), ran down the jetty to finish with a fantastic dive into the water. 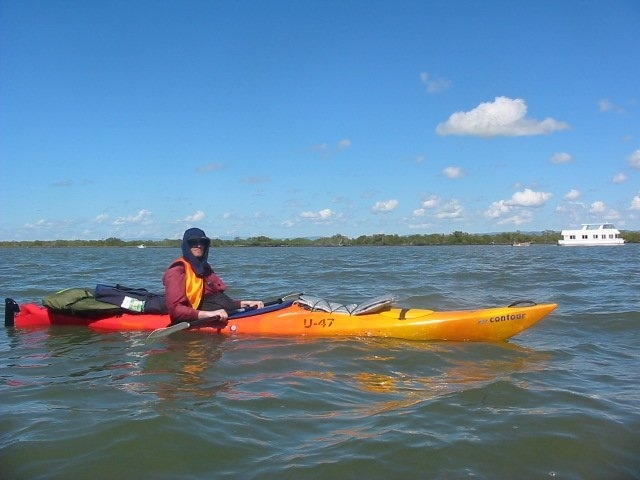 While he swam out confidently towards the boats, I was backing off, and put my paddle into strike position. He came up to Mark's boat, grabbed the nose and gasped 'Beverley'. With a ginger moustache this was clearly not the Beverley he was expecting. We all looked as surprised as each other. He had taken me in my boat as the 'Kate' we had heard people talk about, which meant to him that person in the Osprey with the sail had to be her mother 'Beverley'. Gee Beverley this guy is something else - never had a man scream out, strip off and plunge off a jetty in full public view for me. 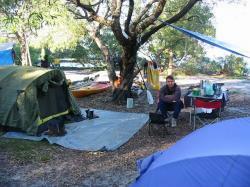 After drifting up the Broadwater together we parted company and headed across to set up camp at Currigee North.